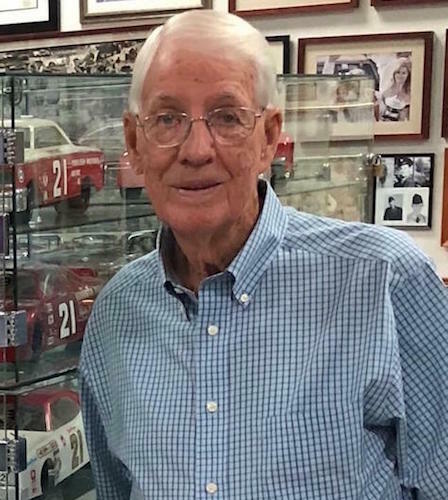 Glen Wood, NASCAR Hall of Fame member and founder of Wood Brothers Racing, passed away at the age of 93 on Jan. 18, 2019, the Wood family announced via Wood Brothers Racing’s various social media channels Friday morning. Wood founded Wood Brothers Racing with brothers Leonard and Delano Wood in 1950, and between 1953 and 1964, Glen Wood was a driver of the team’s iconic No. 21 Ford. In 62-career starts in the series now known as the Monster Energy NASCAR Cup Series, Wood won four times, all of those wins coming at Bowman Gray Stadium in Winston-Salem, N.C.
After his retirement from driving, Wood remained active with the race team, taking on an administrative leadership role for nearly 30 years. He and brother Leonard Wood are considered pioneers of the modern-day pit stop as a result of innovations that weren’t limited to NASCAR competition. As a matter-of-fact, a Wood Brothers Racing pit crew helped Jim Clark win the 1965 Indianapolis 500. Wood Brothers Racing, NASCAR’s oldest team, continues to field its No. 21 Ford in Cup Series competition. The team has 99 premier-series wins, the most recent coming at Pocono Raceway in Long Pond, Pa., with Ryan Blaney as driver. Wood was inducted into the NASCAR Hall of Fame as part of its third class in 2012, a year before his brother Leonard Wood was inducted. “First and foremost, on behalf of everyone at the NASCAR Hall of Fame, we offer our most sincere condolences to Ms. Bernece, Eddie and Carol, Len and Nancy, Kim and Terry, and the entire Wood family,” a statement from NASCAR Hall of Fame Executive Director Winston Kelley read. “There are so many words that describe Glen Wood – pioneer, legend, competitor, dedicated, committed, resilient, humble, authentic and many more. On the track, the team Glen Wood founded in 1950 has amassed 99 premier series victories including exceptional success at some of NASCAR’s marquee races such as five Daytona 500s, four Coca-Cola 600s and four Southern 500s. Glen was an accomplished driver in his own right winning four times in NASCAR’s premier series, five in NASCAR’s convertible division and numerous other Sportsman and Modified division races before hanging up his helmet to focus his considerable talents on the ownership and innovation side of Wood Brothers Racing. Glen reached the ultimate pinnacle of his NASCAR career by being recognized for his incredible accomplishments and contributions to NASCAR by being inducted into the third class of the NASCAR Hall of Fame in 2012. The legendary drivers who have driven for Wood Brothers Racing literally reads as a ‘who’s who’ of NASCAR including fellow NASCAR Hall of Famers David Pearson (2011), Junior Johnson (2010), Cale Yarborough (2012), Dale Jarrett (2014), Bill Elliott (2015), Curtis Turner (2017), Joe Weatherly (2015), Fred Lorenzen (2015), Hall of Fame nominees Ricky Rudd and Buddy Baker along with legendary drivers A. J. Foyt and Dan Gurney, to name a few. “In addition to their on-track success, Wood Brothers Racing is recognized for revolutionizing the pit stops and dropping the time teams spent on pit road by as much as 50 percent. Wood Brothers Racing was recently recognized by the Guinness Book of World Records as the longest active NASCAR team, now at 69 years and counting.